I have always been wondering if there was some gadget application to read my Windows Live Mail on my desktop. There are many options like Mozilla Thunderbird and Microsoft Outlook. 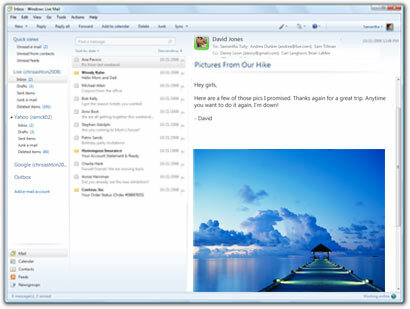 But the best one that is clean and easy to use (in my opinion) was the Windows Live Mail Desktop application. As you can see, it is a very clean and sleek program. It looks like a “lite” version of Microsoft Outlook and supports checking other e-mail account types like Gmail, and Yahoo! Mail. You can download Windows Live Mail Desktop here (click here). P.S. Windows Live Mail Desktop allows you to read the e-mails that you have synced offline.